Those that spend long hours sitting, be it at the office or home, stand a high risk of developing back pains and body stiffness. Blame it all on the conventional chairs we use. Balance ball chairs have come to the rescue to provide a much healthier sitting platform. 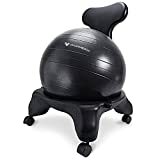 These balance ball chairs keep you active and you can choose to exercise on them between sending emails. That means less time spent on hitting the gym after work. Balance ball chairs come in different designs and sizes to fit both young and old. For instance, there are those designed specifically for kids while others are strictly for adults. But before you hit that ‘buy now button’, are you sure you’ve made the right decision? If not, then I welcome you to explore our list of the best balance ball chairs that might fit your need and budget. 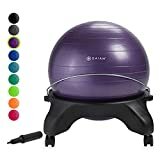 This balance ball chair helps with spinal disorders. 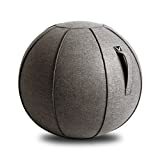 It comes with a yoga ball that has 2000 pounds static strength. The height of the chair adjusts depending on the degree of inflation. It elevates from 22 to 25 inches for great user comfort. Two swivel casters and two lock casters let the chair roll smoothly in any direction. This yoga ball chair has a weight capacity of 300 pounds. 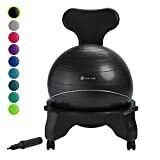 This is a yoga ball chair with a back support that reduces back pain. The back can be removed to transform it into a multifunctional chair and make storage much easier. The ball that comes with the chair measures 52cm in diameter. An inflation pump is included to let you achieve the degree of bounce you need. made of a resilient vinyl material, the ball comes tough enough to accommodate weights of up to 300 pounds. Lockable wheels are included to stabilize balance and prevent any unwanted movement. 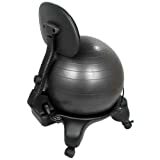 A healthier alternative to the conventional desk chair, this balance ball chair improves back strength. It has a 52cm yoga ball to build core strength and keep the spine perfectly aligned. An air pump is included so you can inflate the ball to a different degree. Such adjustments create different height levels to accommodate users who are 5 feet to 5 feet 11 inches tall. Leg extenders can be fitted on the chair to elevate it to an extra 2 inches. Casters provide easy and smooth glide with great stability. This balance ball chair has a weight capacity of 300 pounds. 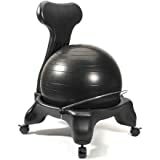 This balance ball chair has no backrest, which makes it a good option for improving stability. 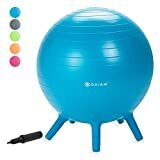 The chair keeps your mind active and has a 52cm yoga ball that creates the level of bounce you need. The height of the chair is adjustable by inflating or deflating the ball. Fully inflated, it can fit persons up to 5 feet 11 inches tall. An air pump is included in the package. The chair has casters that roll and lock in place for easy mobility and improved stability. 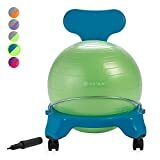 Kids can enjoy the health benefits of this balance ball chair. It’s designed to stay in place to create a healthy, flexible seat. The ball generates some movement for improved blood flow and hence increased concentration. The ball is available in two sizes of 45cm for kids and 52cm for juniors. This balance ball chair has a weight limit of 300 pounds. It’s available in four different colors of blue, gray, pink, and lime green. This balance ball chair employs the same principle as yoga balls found in the gym. The chair has a straight back support that improves healthy posture. Fully inflated, the yoga ball stretches 52cm in diameter. The bounce created by the ball acts a shock absorber that helps ease your body. The ball can be inflated to a different degree to let you sit low or high. This chair is recommended for users who are 5 feet to 5 feet 11 inches tall. It sits on casters and can support users up to 300 pounds. 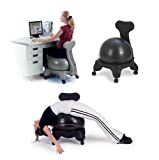 This is a stability ball chair that comes with a back support and rolling casters. The chair helps maintain healthy posture while keeping the mind focused. The yoga ball on this chair measures 35cm when fully inflated. This balance chair is for kids who are 5 to 8 years old and measuring 42 to 51 inches tall. The package includes an easy-inflation pump. This chair supports up to 175 pounds. Vivora Luno ball chair comes with no base support. It’s a rolling yoga ball without wheels. This self-standing ball chair has strap-on handles for easy carrying. It sets up quickly via the inflation pump included in the package. A non-slip grip at the bottom keeps you stable. It’s a functional and fashionable balance ball chair to keep you active anywhere. This ball chair comes in a large size to improve posture and eliminate stiffness in adults. A straight back support is included for correct spine alignment. The back support has a mesh fabric that lets your back breathe with ease. This chair rolls on casters that can be locked into position to provide the stability you need. 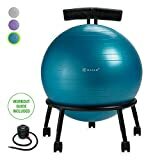 The yoga ball that comes with the chair can be inflated to different levels to provide an adjustable fit. If you’re looking for a custom-fit balance ball chair, this chair might make a perfect match. The chair has a ring on which a large yoga ball sits. This ball measures 55cm at full inflation and can be adjusted to fit users from 5 feet to 5 feet 11 inches tall. The chair has a backrest and sits on 5 adjustable legs fitted with easy-glide lockable wheels. A workout DVD is included in the package. This balance ball chair has a weight limit of 300 pounds.